This week our letter is Y and in thinking of topics to cover it occurred to us that perhaps instead of looking at words beginning with the letter Y, we should look at words ending in “y”. The obvious choice then is the” y” in archaeology. Archaeology is a science and by mere definition its suffix means- the scientific study of a particular subject (Cambridge Dictionary). Archaeology is the study of past human behavior and culture through the systematic recovery and analysis of material remains or objects. Archaeology is a subfield of Anthropology which is the study of all human cultures. Archaeology is the only discipline that examines all times periods and all geographic regions inhabited by humans. It is through this discipline that we are able to examine patterns of human behavior and how and why cultures change or adapt over time. Making archaeology and anthropology relevant to the general public is our goal and often our biggest challenge. 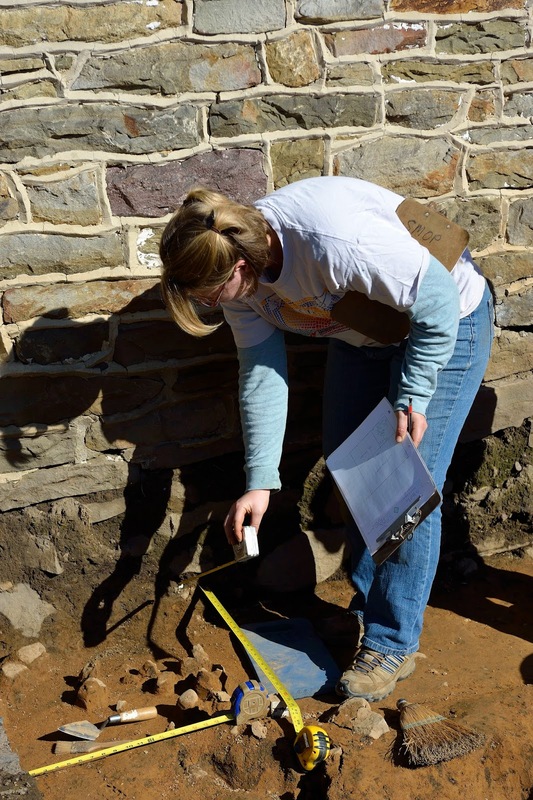 Archaeologists examine the past through the analysis of remains left by human activity. 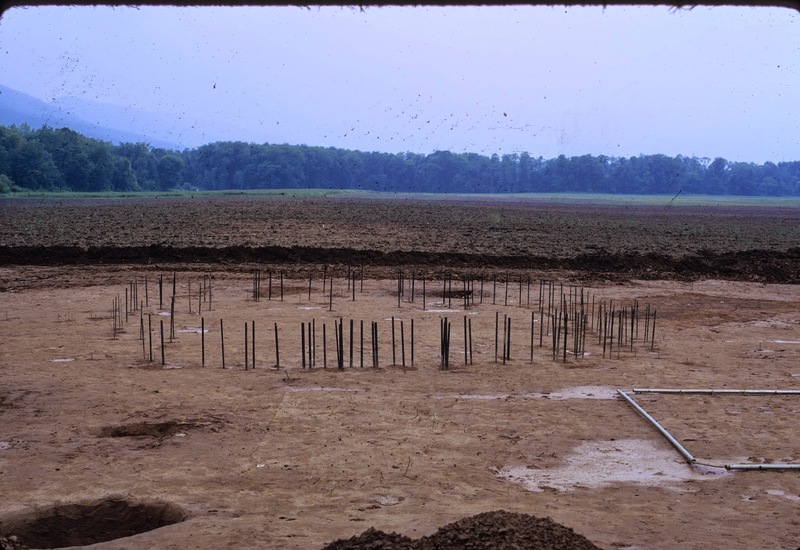 We often discuss artifacts that are recovered during excavations in our blogs, but there are also features or cultural activity that is apparent in soils. Examples include post holes from house structures, fire cracked rock from hearths and refuse pits for discarding of food waste. Artifacts represent the tangible remains of past human activity and are more likely to evoke an emotional bond with other cultures for the general public, but we require more than an artifact to understand its significance. The story or picture of the past is created through multiple processes including analysis of soil disturbances and the artifacts associated with those activities. Systematic comparative analysis of multiple examples of the same type of artifact provides us with a better understanding of the object’s meaning or function and enables us to make those objects relevant to a broader audience. Why is archaeology or our cultural heritage important or relative to you and me today? Because as our world changes and we are introduced to other cultures and other perspectives we must have an understanding and appreciation for past human behavior in order to value everyone’s place in society. Archaeology provides an unbiased description of the past that historians often do not. History is often biased by those who record the events, but archaeology reveals the events based on the scientific evidence. An example of archaeology revealing a more accurate picture of the past is the archaeological evidence of survival at the site of Jamestown in Virginia. (hyperlink http://historicjamestowne.org/archaeology/jane/ ) Understanding how and why cultures have changed in the past, the events or circumstances that evoked those changes provides answers to how we might better adapt to changes in the future. The destruction of historic and archaeological resources is occurring at an alarming rate and while archaeologists understand the significance of these sites, others often do not. 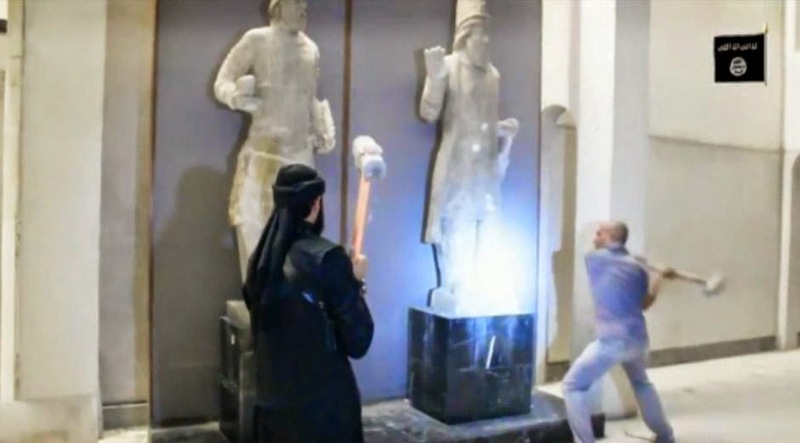 Most of us are concerned by recent attacks on historic sites in the Middle East, and fear for the survival of artifacts that represent thousands of years of cultural development. Unfortunately, these acts of destruction are not the first time groups have chosen to destroy evidence of the past and it will likely not be the last. The loss of these resources is painful, but when we consider that cultures have survived these events in the past, we can find hope in their continued survival. Archaeology and anthropology are important tools in understanding our cultural heritage and provide many of the answers society desires in dealing with the future. In summary, the importance of the letter “y” in archaeology is that it depends on “you”. You are the individuals that can value archaeology and our heritage. You are the individuals we want to inspire to learn from the past and for whom we offer museum exhibits and public programming. We hope you will take a few minutes to examine your cultural heritage and the impact that archaeology has provided in understanding our past. Help us to insure that our archaeological heritage is preserved by supporting public programs and preservation laws so that we can protect the past for future generations. This week in our alphabetical trip through Pennsylvania archaeology, we have reached the letter “X”; and, to keep it simple, “X” stands for axes, specifically stone axes. Axes are one of several hafted stone tool types that are differentiated by the angle at which the head is seated. 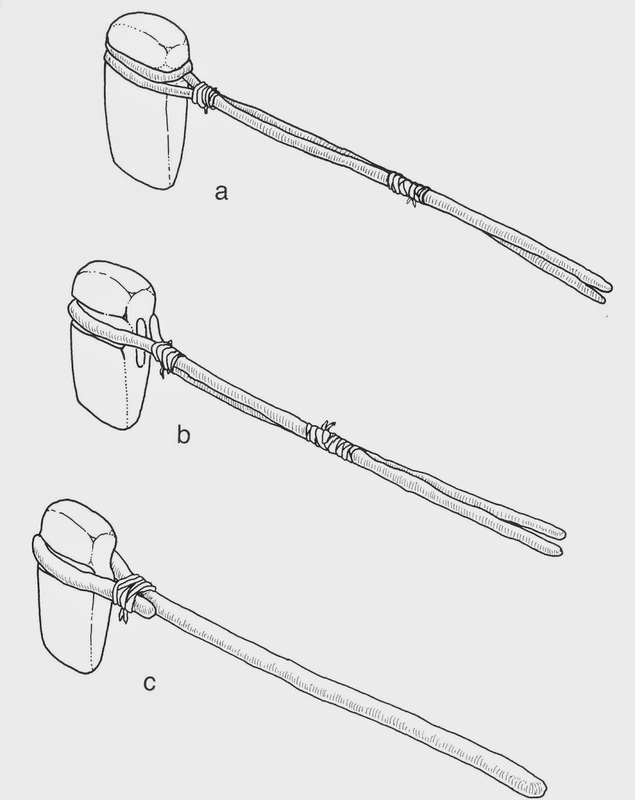 An axe blade or head, is hafted parallel to the handle rather than perpendicular to the handle as in hoes or adzes. There are two basic axe forms; chipped axes and pecked and polished axes. Chipped axes have two opposing notches and the notches were used in the hafting process. They are relatively simple to make and were used during many time periods in prehistory. Ground and polished axes are grooved for securing the head to the handle. A full grooved axe has a groove that encircles the entire piece. On the ¾ grooved axes, the groove does not extend to the bottom side. Ground and polished axes frequently start out as river cobbles that were chosen for their general size and shape. Metamorphosed siltstone or sandstone, basalt or diabase was frequently used and sometimes quartzite. Depending on the degree of stone that needed to be removed to reach the desired shape, axes are first chipped to remove excess material or if only a small amount of material needs to be removed, they are pecked into shape. The pecking process involves using a stone hammer and repeatedly but carefully striking the axe blank, removing small pieces of the surface. The groove formed early in the manufacturing process. Once the entire surface was pecked to the desired shape, the axe blank was rubbed on a piece of sandstone to smooth the surface. 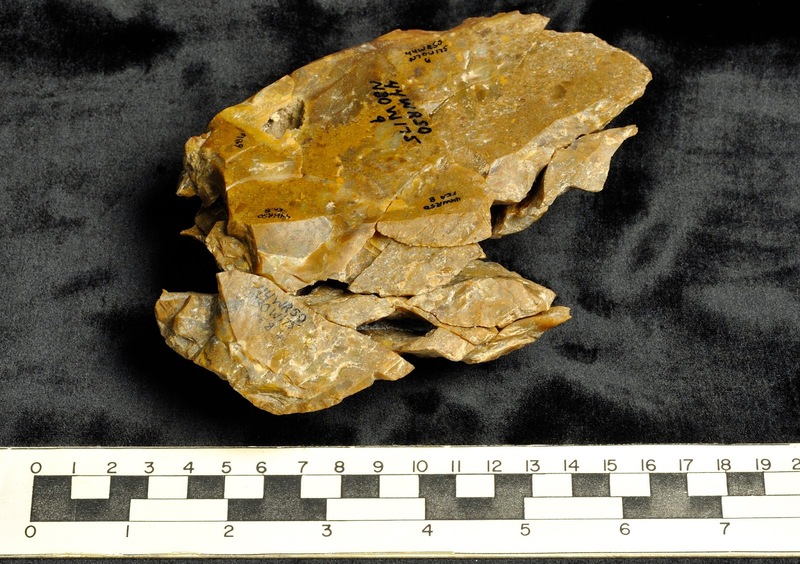 Although not found in Pennsylvania, special axe grinding slabs have been found in the western United States. In order to attain a very high polish, the final rubbing takes place on a charred piece of wood. 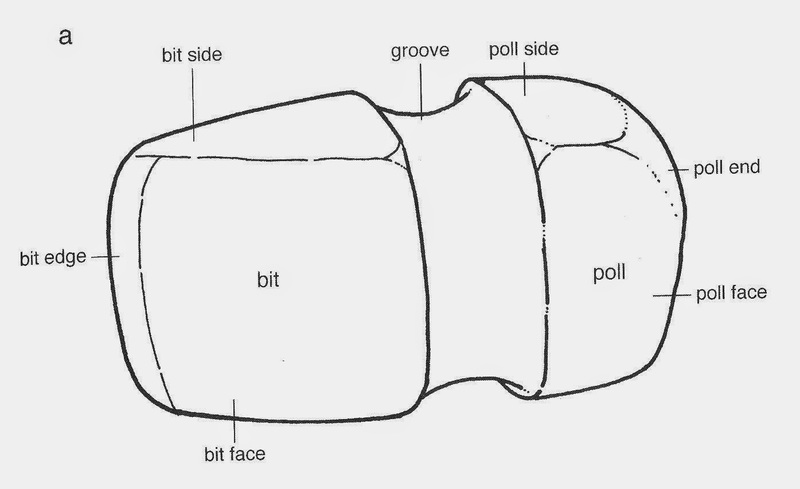 Full grooved and ¾ grooved axes were hafted slightly differently as can be observed in the figure below. The functional differences, however, are not clear. In addition, sometimes the groove is bordered by a ridge on one or both sides and sometime there is a double groove. It is assumed that this was part of the hafting method but again, the functional differences are not clear. Depending on the hardness of the stone, the manufacturing process for a full grooved and completely polished axe required 30 to 60 hours of work. Axes were sharpened by simply grinding down the bit end as it became worn. Most of the axes in The State Museum collection are broken or worn down, nearing the end of their use life. However, some are very large (see below) and some of the unfinished pieces are extremely heavy weighing 4445 gr or 10 pounds and measuring 39 cm or 15 inches in length. Native Americans have been using axes to cut wood ever since they arrived in North America. However, during the Paleoindian period (11,700 - 20,000 BP.) they are neither notched or polished and difficult to identify unless systematic microwear studies are conducted. It is not until the Middle Archaic period (6850 – 10,200 BP.) that ground and polished axes are produced. 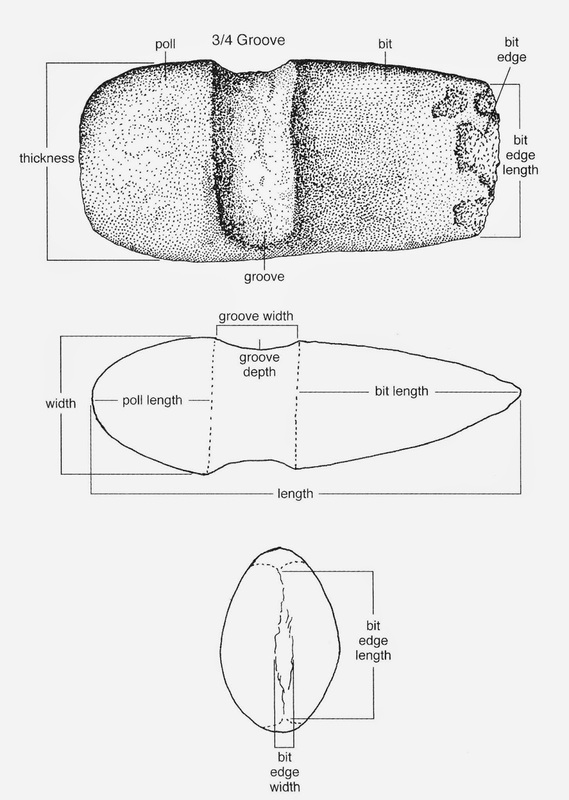 Full grooved axes are the earliest and ¾ grooved axes do not appear until the (Late Archaic 4850 – 6850 BP.) and become common during the Transitional period (2800 – 4850 BP.). The State Museum is initiating an inventory and preliminary analysis of its unprovenienced collection of grooved and chipped stone axes. This group of artifacts was received as part of various donated collections such as those from Gerald Fenstermaker and Samuel Farver and are not located by specific site. They are primarily from eastern Pennsylvania and mainly the Susquehanna drainage basin. Up until a month ago, they were stored in boxes and underutilized. For exhibit or research purposes, we didn’t know what we had unless we inventoried and catalogued all 54 boxes. Our goal is to make a list of all that we have, catalogue them by type and take some basic measurements to determine variations in size, breakage patterns, how they were made and the lithic materials that were used. Our intern this semester, Tamara Eichelberger from Elizabethtown College, has volunteered to process the collection. Although they had been washed sometime in the past, over 40 years of dust had accumulated so they needed to be wiped clean. Since each will be measured and entered into a data base, each needs an individual catalogue and specimen number. With the help of volunteers, Tamara is completing the labeling process and will begin taking measurements next week. There are over 500 specimens in the collection so she should be able to develop a good characterization of axes from eastern Pennsylvania. The results of her analysis will be the subject of a blog in early May. 2014 Ground Stone Analysis: A Technological Approach. The University of Utah Press, Salt Lake City.